This not only allows us to quickly diagnose and treat your pet's illness, but also provides us capability for senior wellness screening to keep your aging pets healthy. In addition, we have access to several outside reference labs for more specific tests. Whatever your pet's situation, it can be fulfilled. 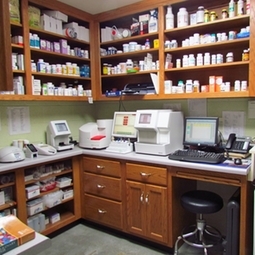 In our pharmacy we stock a wide range of the best veterinary drugs in the animal healthcare industry which allows us to serve you better in a timely and accurate way.